Study English with a British Council accredited English school in Brighton, UK. Our teachers are friendly and professional. We will help you succeed in the international community. Learn the English language fast at our fantastic English School. Enjoy the supportive atmosphere of our English lessons. Learn English in small classes with students of different nationalities, cultures and ages. We have a range of different English language courses to suit your aims and needs. Castle School is an English language school in the heart of central Brighton. Our school is just a short walk from the train station. We have quick and easy access to all the local shops and facilities. Brighton has an exciting and fashionable city centre. 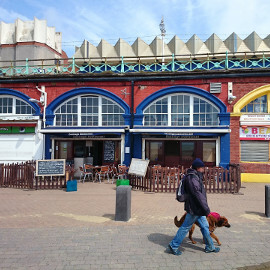 We are less than a 10 minute walk from the famous Brighton Beach. Study English in our vibrant and diverse city by the sea! Improve your level of English with our General English Language Courses. Grow your vocabulary, develop your fluency and boost confidence. Work on your speaking, listening, reading and writing skills. The Cambridge English Exam qualifications are valid for your lifetime and are internationally recognised. Increase your confidence and feel prepared for exam success. IELTS can help English speakers of all levels gain access to more education and employment opportunities. Our IELTS course focuses on strategy and exam practice to get you the best results. Get ahead of the competition and further your career. Private, one on one, English lessons help you focus on improving your level of English. Lessons are tailored to your learning needs. Make progress faster! Why Learn English in Brighton? Castle School is in the heart of Brighton. A short walk from the station and Brighton’s famous beach. Enjoy the many exciting cafes, bars, clubs and shops while you study English! Find out more about the Castle School Experience. Our modern teaching methods are designed to meet your needs and expectations. We encourage you to learn through communication. Build your confidence and discover new vocabulary. Find out more about our teaching methods. Our objective is to "To help students achieve their goals in the international community". Founded on four core values, your needs are at the heart of everything that we do. Read more about us and studying English with us. Your English adventure starts today. Get a quote online and enrol on our English courses. We will help you select your accommodation and assist with your visa application. We look forward to meeting you. If you study English in Brighton, make sure you visit The Royal Pavilion. If you choose to study English in Brighton, you will get plenty of opportunities to explore the city and its places of interest and tourist attractions. 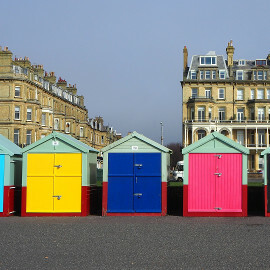 Brighton, on the south coast of England, has many tourist attractions. There is the beautiful beach with its impressive sea views and fresh sea air, there is the Brighton Pier with it‘s fun and entertainments, but probably the most interesting attraction is Brighton Pavilion, also known as The Royal Pavilion. Prince George the Prince Regent (future king George IV) built the Pavilion at the end of the 1700s. This is because his doctor told him he should get some fresh sea air for his health. Have you noticed that English people often talk about the weather? Have you ever wondered why? It is because the English weather changes constantly. It can change from windy rain to hot summer sun in five minutes. Honestly, I’m not joking! Anyone who has been to England will tell you this is true. The weather has a huge impact on life in England. We plan our days around the weather, and change those plans as the weather changes. It is always relevant to us, and we really appreciate nice weather. This is why we talk about the weather. It makes a difference to us. Students learn English faster when they are motivated. This has always been the fundamental principle behind Castle School’s teaching philosophy. We believe that enhancing each student’s motivation is the key to a successful and enjoyable learning experience. Students are motivated by a wide range of factors. There are many different types of motivation. For example, most students are motivated to learn English because it will improve their employment prospects. Many people also want to learn English so that they can communicate and socialise more easily when they travel. These are examples of why students book an English course in the first place. However, what about motivation in the classroom, during a lesson? Video is a great tool to use in English language lessons. It can really get learners engaged in a topic, and is also a fantastic way to generate interesting and communicative group activities. It can be great for speaking, listening and even writing practice if used imaginatively. Even examination preparation classes such as IELTS, FCE, and CAE could benefit from occasional short video clip activities. There are so many ways to use video in the classroom, and below are a few ideas. Do you need a "perfect" English Accent? Students who want to learn English in England often want a "perfect" English accent. They don't want an accent from their first language. They believe their English learning journey will not be finished until they sound like a native speaker. It is understandable that a lot of people have this attitude, and there is nothing wrong with wanting to perfect a skill. As a matter of fact, I am impressed when I meet someone whose English is at such a high level that I mistook them for being English at the start of our conversation. I always reflect on what an incredible achievement this is. Learning English reading skills: Common mistakes. The best way to improve your reading skills is to practise. You can do this on your own, and it would probably be helpful to join an English language school. English Language schools understand that reading is a very important part of learning English more generally. Improving your reading skills will actually help you improve your writing, your listening and even your speaking skills. It will also help you learn new vocabulary and develop a better feel for how sentences are constructed and the different ways English can be used. 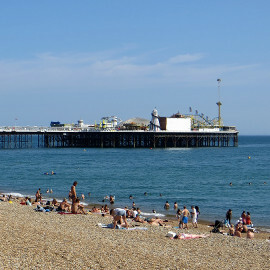 Brighton and Hove has grown over the years and in the 21st Century is very popular. Around 275000 people live in Brighton, and with 2 universities the population is comparatively young and progressive. 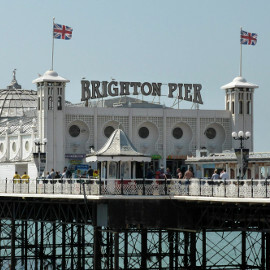 A large number of international students study English in Brighton and Hove. Castle School of English would like to point out that 69% of Brighton’s voters voted to remain in the European Union in the 2016 referendum. How exactly does Castle School help you with your English learning? Together we identify the right English course for you at Castle School and establish your language requirements. There are different approaches to teaching English around the world. In some countries, especially for younger pupils in school, English lessons are a relatively quiet experience. There is a teacher at the front of the class explaining what words mean, and how they are used in sentences, and grammatical rules. The learners quietly take notes. There will be a test soon to check they were listening and have “learnt” the new English. In the UK this teacher centred approach would be generally regarded as an old fashioned way of teaching English. If you book an English language course, including Cambridge examination courses such as The First Certificate Examination or Cambridge IELTS, at a language school in the UK, DO NOT expect to be taught in the way described above. Is socialising and practising English important? Yes, in fact socialising and practising English is necessary! Learning a language is not the same as learning something more factual like for example, history. When you learn history, you add information to your knowledge. To be very good at history, you simply need to know a lot about history. So what is the difference between history and English (or any language)? To be good at a language, you have to know a lot about it and use it well! If you want to be good at English, you need to learn how to use it. Learning English is a develpmental process. What is the best way to learn how to use it? Practise! Practise! Practise! Is learning English a good idea? It is good for your brain! It improves your memory because it exercises the memory part of your brain when you learn new vocabulary and new grammar rules. It also enables you to think in a different way about the world because different languages express the world differently. Through learning a new language you can see the world through slightly different eyes. Also, it is supposed to be very good for keeping your brain functioning like a young brain even if it is a bit old! I am nervous about my Cambridge English exams. Are you preparing for English exams? Perhaps you will soon be taking the Cambridge First Certificate (FCE) the Cambridge Advanced (CAE) or maybe the IELTS (International English Language Testing System). How are you feeling about it? Different people feel differently about English exams. Believe it or not, some people actually enjoy them! However, the majority of people get quite nervous about their English exams, and if you are feeling terrified, you are not alone!